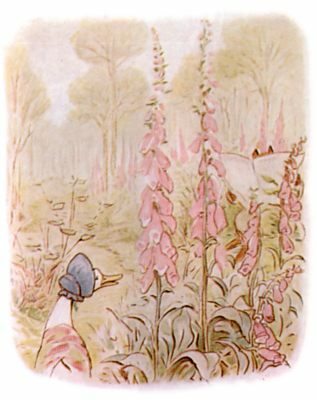 The Tale of Jemima Puddle-Duck is a children’s book written and illustrated by Beatrix Potter. It was first published by Frederick Warne & Co. in July 1908. Potter composed the book at Hill Top, a working farm in the Lake District she bought in 1905. Following the purchase, her works began to focus on country and village life, incorporating large casts of animal characters and sinister villains. 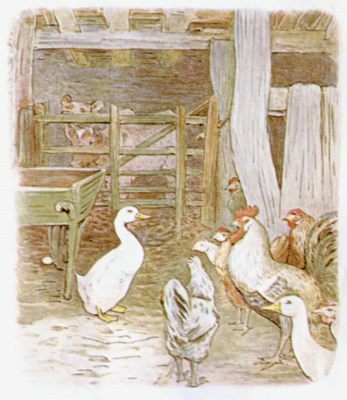 Jemima Puddle-Duck was the first of her books set wholly at the farm with background illustrations based on the farm buildings and yard, and nearby locales. Jemima is a domestic duck whose eggs are routinely confiscated by the farmer’s wife because she believes Jemima a poor sitter. Jemima searches for a place away from the farm where she can hatch her eggs without human interference, and naively confides her woes to a suave fox who invites her to nest in a shed at his home. Jemima accepts his invitation, little realizing her danger: the fox plans to kill and roast her. Kep, a collie on the farm, discovers Jemima’s whereabouts and rescues her just in time. Potter indicated the tale was a revision of “Little Red Riding Hood” with Jemima, the fox, and the dog parallels to the fairy tale’s heroine, wolf, and woodcutter. Jemima, Kep, the farmer’s wife and her two children were all modelled on real world individuals at Potter’s Hill Top farm. The book was hugely popular. Spinoff merchandise included a soft Jemima doll in bonnet and shawl, a Jemima painting book in 1925, and illustrated fabric placemats hand-fashioned by Potter and distributed to friends. Critically, the book is considered one of Potter’s best. 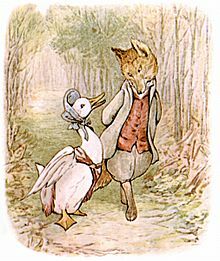 In 1971, the tale became a segment in the Royal Ballet film, The Tales of Beatrix Potter, and, in 1993, it was telecast as an episode on the animated BBC anthology series, The World of Peter Rabbit and Friends. The tale begins in a farmyard which is home to a duck called Jemima Puddle-duck. She wants to hatch her own eggs, but the farmer’s wife believes ducks make poor sitters and routinely confiscates their eggs to allow the hens to incubate them. Jemima tries to hide her eggs, but they are always found and carried away. She sets off along the road in poke bonnet and shawl to find a safe place away from the farm to lay her eggs. At the top of a hill, she spies a distant wood, flies to it, and waddles about until she discovers an appropriate nesting place. However, a charming gentleman with “black prick ears and sandy-coloured whiskers” persuades her to nest in a shed at his home. Jemima is led to his “tumble-down shed” (which is curiously filled with feathers), and makes herself a nest with little ado. Jemima lays her eggs, and the fox suggests a dinner party to mark the event. He asks her to collect the traditional herbs used in stuffing a duck, telling her the seasonings will be used for an omelette. Jemima sets about her errand, but the farm collie, Kep, meets her as she carries onions from the farm kitchen. She reveals her errand, and Kep sees through the fox’s plan at once. With the help of two fox-hound puppies, Kep rescues Jemima and the “foxy-whiskered gentleman” is never seen again. However, the hungry fox-hounds eat Jemima’s eggs. Jemima is escorted back to the farm in tears over her lost eggs, but, in time, lays more eggs and successfully hatches four ducklings.